Ubisoft is hoping the prospect of Beyond Good and Evil 2 will generate a few sales for Rayman Origins. "Ultimately, Rayman is [Michel Ancel's] original creation, and if all the people that love Beyond Good & Evil understand he is more than a one trick pony ... and that if Rayman Origins does well, it gives him more leeway for other opportunities because he has to build up his studio," said Ubisoft's Sales VP Tony Key. "Other opportunities," in this case, meaning the long awaited follow-up to Ancel's highly regarded Beyond Good and Evil. "Beyond Good & Evil: HD is doing very well on PSN and Xbox Live and there's a lot of people coming back, and if they choose to do a sequel the audience is bigger than before," he added. Beyond Good and Evil 2 seems to be in a bad place right now. It's not cancelled, per se, but the team working on it is tiny and there's little to show for nearly a decade of waiting, save a teaser trailer, a very exciting target render and a vague promise that the game is being developed for next-gen consoles. Considering the original B&G sold about as well as a ten-dollar punch-to-the-kidneys, despite great reviews, it's not surprising Ubisoft is hesitant to invest heavily in a sequel. This isn't the first time Ubisoft staff have implied, perhaps in jest, that B&G2's future depends on the sales of a current title. 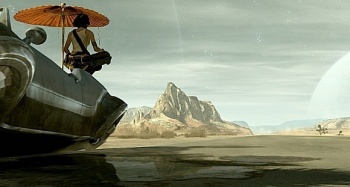 It was rather heavily implied that the performance of Beyond Good and Evil: HD was being used to gauge the market for the apparently upcoming sequel. While it's fairly obvious that publishers will be looking at sales of similar games, or of games from the same team, when deciding whether or not to fund a sequel, talking about the process so openly - even if it's with a knowing wink - does make it seem like Ubisoft is holding the game hostage. It's also worth noting that Rayman Origins is being released in the same month as Modern Warfare 3, Skyrim, Saints Row: The Third and The Legend of Zelda: Skyward Sword . As good as the game may be, I doubt it'll rake in the millions. Rayman Origins arrives on PS3, 360 and Wii on November 15th.